Caiman free games: Rambo Remake by Mick Farrow. Shoot-em-up, rescue the Pows & find the helicopter to escape. 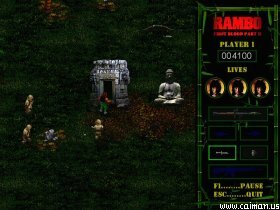 An enjoyable game with dark isometric graphics. The game takes place in the jungle. Your orders are to find the Pow camp and take pictures. Then head north to the helicopter extraction point. However, when you arrive at the camp and see your former comrade Banks you know that another scenario will unfold. Use your knife to cut Banks free then head north to the helicopter. Having located the chopper you must return to the Pow camp to rescue the other prisoners. Hurry up though, as once the Pows are freed the enemy will be on full alert and a powerful helicopter gunship will be sent in pursuit. Engage in combat with this fearsome machine and head to the safety of Thailand. Rambo starts with 4 lives but can gain extra lives with large scores. Bonus points are archieved by collecting various weapons hidden at strategic points. Weapons: Knife, grenade, arrow, explosive arrow, machine gun and rocket launcher. - Use of loud weapons will alert enemy. - Use knife to free Pows. 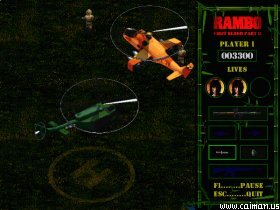 - Only the rocket launcher can be used in helicopter. Walkerton 4 - Semy Auto.